This publication was assembled with the sports car enthusiast in mind. However, the appeal of this manual isn't confined to such a limited group; anyone who owns a B-series engine will derive great benefits from the material presented here. There are several reasons why a person might want to work on his/her own car. To begin with, a great deal of money can be saved, although often at the expense of an equal amount of time and effort. The automobile enthusiast takes pride in and derives pleasure from driving a well-maintained machine and will go to great lengths to keep the car in such condition. He is quite often extremely knowledgeable about the workings of his car and firmly believes that the care and attention he can provide far outweigh the experience of a professional mechanic who is merely doing his job. Furthermore, he realizes that an intimate knowledge of his car's behavior helps to make him a better driver. What follows is intended to provide some useful information and hints to the less-experienced individual who would like to work on his own car. Changing the oil in a car is one of the most basic tasks someone can perform to keep a car in good working order, and the following step-by-step instructions will ensure success. 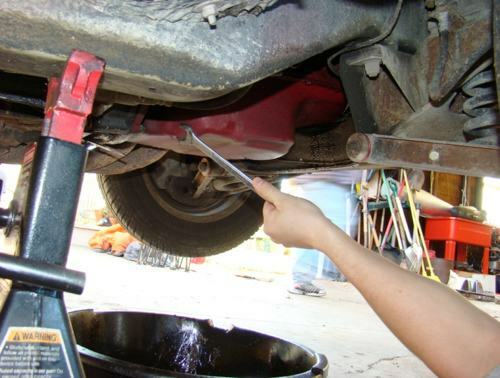 Be aware that the oil-change process can be messy. Squeaky clean-type individuals should consider taking their car to an auto-repair shop and letting them do the dirty work. 1. Select the location where you'll change the oil. Make sure the surface is level, flat, and solid. Cover the area with old newspapers or cardboard to protect it from spills. 2. Drive the car around your neighborhood until the temperature gauge begins to register. 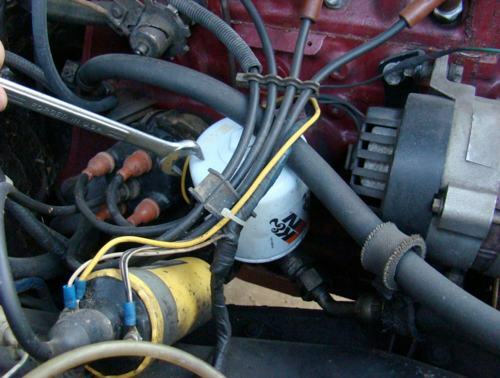 This will heat the oil so it is thin and easy to drain from the engine. Once the engine has warmed up, park your car on the area you covered with newspapers or cardboard. 3. Put the car in first gear or reverse. Set the parking brake firmly to ensure the car doesn't move while you're jacking it up. You can block the tires with rocks or bricks for extra measure. 4. Put on your latex gloves, safety glasses, and old clothes. 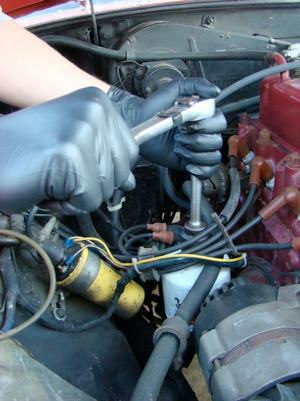 Some people change the oil with bare hands, but there is always the option of wearing gloves for extra protection. The safety glasses will protect your eyes from the dirt and grime that can dislodge from the car as you're working on it. DO NOT USE THE ORIGINAL JACK. IT IS MEANT TO WORK ONLY WITH THE ORIGINAL JACK POINTS WHICH MAY BE ROTTED. For this step, you will need a jack and two jack stands. 1. Find the front cross member of the car. It is located at the front of the car between the tires. Center the jack under the cross member and begin to jack the car up. Make sure the jack holds the car well; sometimes the weight of the car can cause the jack to shift. Jack the car up about a foot or so, enough to make sure there is clearance to lie under the car. Center the jack under the cross member. 2. Next, find a solid spot to place your jack stands. Do not use the factory jack points; most are rotted and unsafe. This is a mono construct body car, so you need to keep in mind there is no frame to place jack stands under. I place my stands under the subframe on opposite sides of each other at the same length of the car. Slowly release the pressure on the jack to let the car rest on the stands. Make sure the car is supported and balanced well by the jacks. Remember you will be underneath the car. You can leave slight pressure on the jack for added safety. I prefer it out of my way because of the limited amount of room under the car. 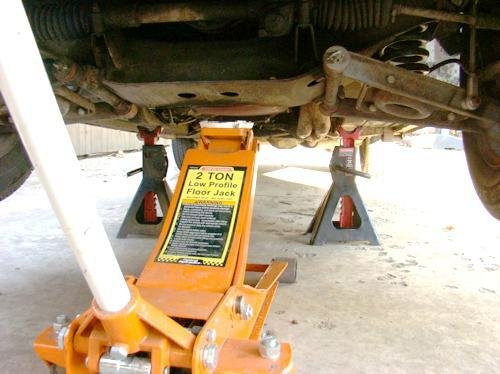 Place the jack stands under the car so it is balanced and supported. 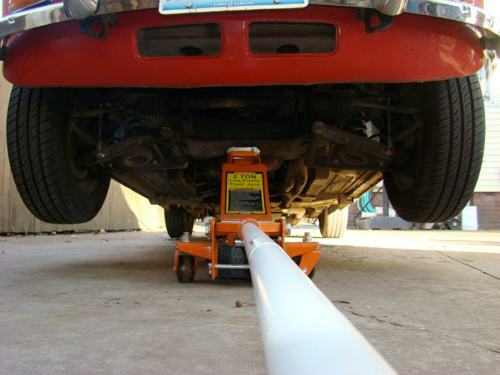 USING THE WRONG JACK POINTS CAN CAUSE THE CAR TO FALL ON THE MECHANIC UNDER THE CAR. For this step you will need your drain pan, ratchet and socket set, and some paper towels or rags. This would also be a good time to put on your gloves and safety glasses if you haven't already. YOU WILL BE WORKING WITH HOT OIL. KEEP YOUR HANDS AND FACE AWAY FROM THE OIL AS IT DRAINS TO PREVENT BURNS. 1. Check the engine to make sure it's cool enough to work around without getting burned. 2. Place the 3/4-inch socket on your ratchet. 3. Now you're ready to get under the car. Place the drain pan directly under the engine oil sump drain. Use your ratchet to un-tighten the drain plug, turning it in a counterclockwise motion. Once the plug is un-tightened use your fingers, if possible, to loosen the plug all the way and remove it. Use caution when removing plug; hot oil will come out quickly. Be sure to keep a good hold on the plug. You don't want to search through 5 quarts of hot oil looking for it. Once the plug is removed let the oil drain into your drain pan. Allow at least 10 minutes for all the oil to drain; only a very intermittent oil drip, or none at all, should remain. Remove the plug and drain the oil into the drain pan. 4. Inspect your sump drain plug for any metal shavings or irregularities; finding these is a sign of excessive wear or part failure. Magnetic oil drain plugs are also available to aid in this inspection. After inspecting, be sure to clean the plug thoroughly with a paper towel or parts cleaner. Once clean, inspect the sealing ring. If there is any damage or excessive wear, the ring should be replaced. Some owners prefer to replace the copper crush washer with every oil change, to eliminate a potential source for oil drips. 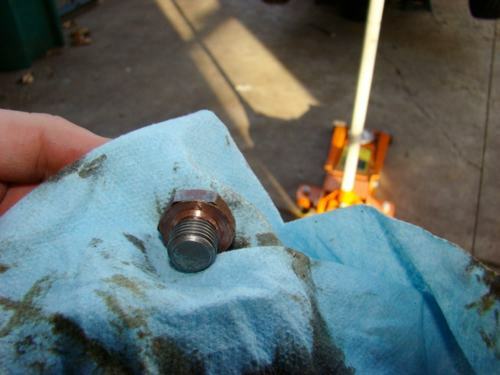 Clean the oil drain plug and inspect it. 5. Once all the oil is drained and the plug has been cleaned you're ready to refit the plug. Use your fingers to rotate the plug in a clockwise motion as to tighten it. Be sure not to cross thread the plug; this would ruin your day. Once it has been finger tightened you can use your wrench to tighten it the rest of the way. Make sure not to over tighten; torque specifications are available in the Workshop Manual if desired. 1. 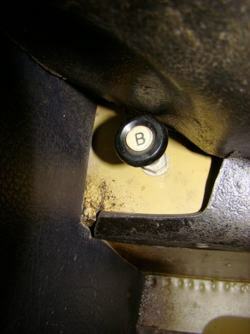 Open the driver's side door (assuming left-hand drive), and find a pull knob labeled "B" (stands for bonnet). The knob is located directly underneath the dashboard, to the far left. Once you've found the knob, pull it outward until the hood pops. You may have to apply some force to the knob; they tend to have problems with electrolysis inside of the cable housings. Once the hood has popped open, make sure the knob returns to its initial position. Pull the "B" knob out to pop the hood. 2. Go to the front of the car. The hood has a safety latch that must be disengaged before it can open all the way. The latch can be found just to the right of the MG emblem on the grill. Use your right hand to trip the latch and raise the hood. Raise the hood until the hood support clicks. For this step you will need your new filter, one quart of oil, a drain pan, paper towels, socket and ratchet set. 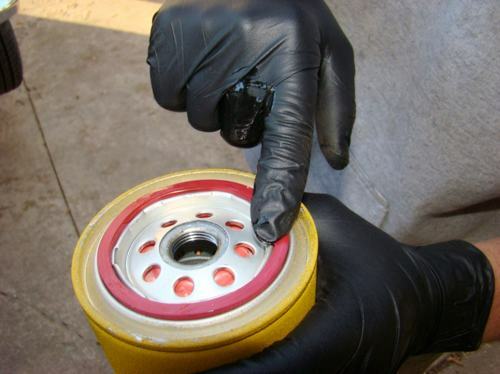 An oil filter wrench may be required if the filter was tightened securely during the last change, or the filter is very old. You may find that using the filter wrench can be a bit difficult because of the limited space in the engine bay, but some come with a tilting handle that make it easier to maneuver. Depending on the model and year of your car, and if a spin-on oil filter adapter kit is fitted, your oil filter may be hanging or "inverted", the directions are the same, but obviously the direction to tighten or loosen the oil filter is reversed. Very early cars may still be fitted with the original re-usable oil filter; changing the filter element in these filters is not covered here. THE ENGINE MAY STILL BE HOT! BE CAREFUL AS YOU WORK AROUND IT TO AVOID BURNING YOUR HANDS. 1. Locate the filter. It is to the left of the engine, about an arms length back from the front of the car. The engine oil filter in this photo is white. 2. Place the drain pan under the filter. When you remove the filter some excess oil will run out. To remove the filter, spin it counter-clockwise off of the filter base. To spin the filter, you can use a socket on a ratchet or a filter wrench. Not all oil filters will have a hex attachment on the top. The filter has a tendency to tighten on the base, so don't be afraid to apply extra pressure. Spin off the filter in a counter-clockwise direction. 3. Once the filter has been spun off the base, drain the remaining oil and recycle the filter if possible in your region - you may end up having to throw it in the garbage. Use paper towels to clean off the filter base and any spills around it. Make sure everything looks normal(no gunk or cracks). 4. Take your new filter cartridge out of its box. Open a container of new oil, and dip your finger into it. Smear the oil on your finger onto the sealing ring of the filter cartridge. This will help the cartridge seal to the base. Then take the cartridge and place it on the filter base. Using your hands, slowly thread the filter onto the base in a clockwise motion. Be sure not to cross thread the filter. Use your hands only to tighten down the filter. Never use any tool unless instructed. Apply oil to the sealing ring. For this step you will need your five quarts of oil, or whatever amount is specified in your Owner's Manual. You may also want to use a funnel to help you. Be sure to have paper towels ready in case of a spill. Continue to be cautious around the engine as it may still be warm. CLEAN UP OIL SPILLS IMMEDIATELY TO PREVENT SLIPS, FALLS, AND POSSIBLE INJURIES. 1. Locate the valve cover on the engine. It is located directly on top of engine. There is a large black cap located in the valve cover. The cap is the oil fill point. Remove the cap by twisting counterclockwise and pulling up. Remove the cap from the valve cover. 2. Once the cap has been removed, you are ready to put the oil in. 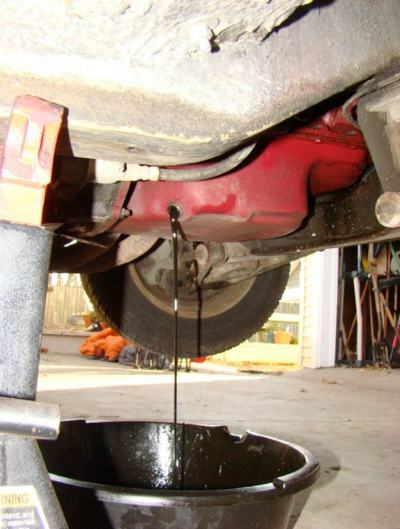 To help prevent drips and spills, use a clean funnel to help direct the oil into the engine. Fill the engine with five quarts of oil or as specified by your Owner's Manual. Use your paper towels to clean any spills — no one likes the smell of burning oil. Do not over-fill. 3. 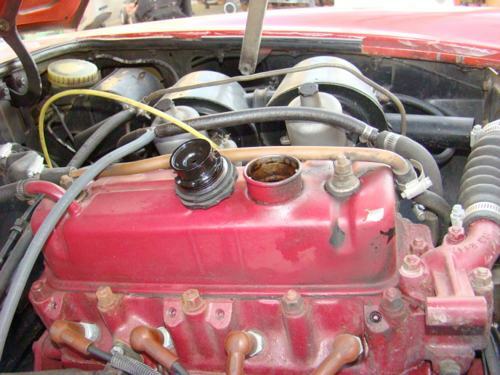 Once the oil has been replaced, put the cap back on the valve cover. Pour the oil into the engine. You're just about done with your oil change. There are just a few small steps left. 1. Use your jack to raise the car off the stands. Remove the stands and slowly lower the car back to the ground. 2. Once the car is back on the ground, let it sit for three to five minutes. This will allow the new oil to drain down through the engine and collect in the sump. Remember, the oil is cold and as a result is thicker and will take longer to drain than hot oil. 3. After a few minutes, start the engine. Do not drive the car. Let your engine run for three to five minutes, just long enough for the oil to circulate. 4. Now you're ready to check your oil level. Find the dip stick in the engine bay next to the filter cartridge. 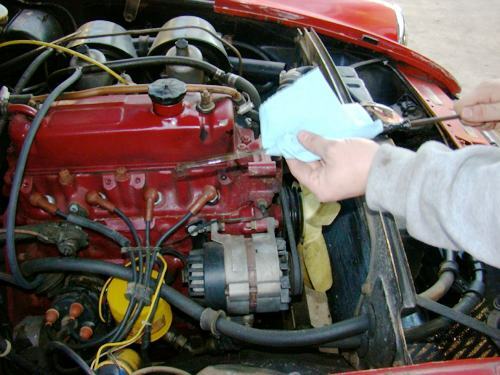 Pull out the stick and wipe off the oil on a paper towel. Re-insert the stick and pull it back out. At the bottom are marks that will show you the minimum and maximum oil level range. If the oil is below the minimum fill mark, add additional oil via the valve cover cap as described above. If the oil is above the maximum mark, you will need to drain the excess or your engine may produce black smoke or the efficiency of the oil pump may be reduced. Wipe the dip stick on a paper towel. 5. Once you've checked your oil and have the right amount, you're ready to close the hood. Release the support latch and slowly lower the hood until the safety latch engages. 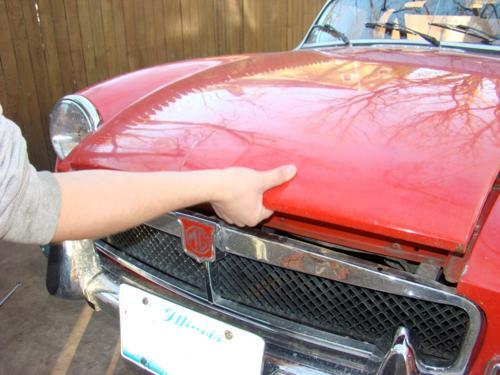 Apply pressure until the hood latch clicks and the hood is flush with the fenders. 6. Before you drive your car, make sure to inspect it for any leaks. 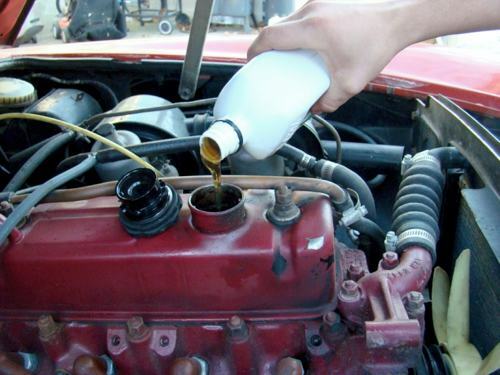 It's a good habit to always check your oil level and other fluids before driving. Make it a daily habit. Remember, this engine was designed in the 1930s and regular maintenance as per the Owner's Manual was expected. 7. Take the used oil, in a sealed container, to a local mechanic or parts store to recycle or dispose of. Many gas stations also will dispose of your used oil at no charge. DUMPING DIRTY OIL IS ILLEGAL AND DAMAGING TO THE ENVIRONMENT. DISPOSE OF IT PROPERLY TO AVOID FINES. Nick Baker resides in Peoria, Ill., where he works with Bill Derker of British Automotive Specialists, repairing and restoring vintage British automobiles. Nick is currently rebuilding a 1959 MGA. 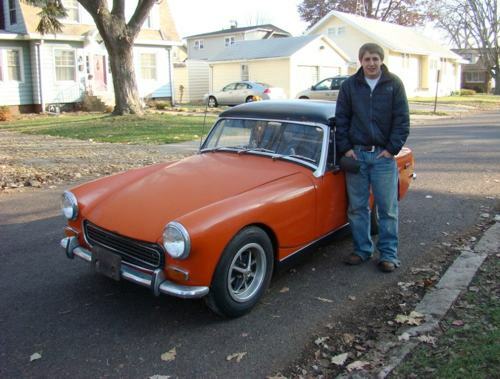 He has owned and rebuilt a 1967 Ford Falcon, a 1970 MGB, a 1973 MGB, a 1972 MG Midget, a 1974 1/2 MGB GT, and a 1977 MG Midget. Comments on "Oil Change Manual for the B-Series Engine"
jack and jack stands, for example). Can I use these instructions for my '74 Midget? Thanks for this article. To some, it may seem obvious, but this is helpful for a rookie, like me! Nice job. For cars with spin on filters I recommend filling the filter with oil before installing. It may leak a little as you put it back on, but the anti-drainback valve in the filter should keep most of the oil in place and it will help you get your oil pressure back faster. Thanks Nick, for a clear and straight forward explanation! If I get a jack and jack stands I will know just how to handle this. one, draining the whole situation again? First, I looked all around the left side of my engine and never did find that oil filter! Second, I always like to watch my oil pressure gauge when first starting, and immediately look for leaks as soon as I confirm oil pressure. Also one should wait to re-check the oil level, maybe 5 minutes, for the oil to drain back into the sump. Otherwise you might get a "false low" reading on the dipstick and add oil to a full system. Had 0-10 in oil pressure, had to try changing oilfilter..
Did this and oil for the first time in my life using your guide..
out driving and is now stable at 50..
What about the oil present in the oil cooler ? Will it also drip out of there when the car is in this position ? Very helpful article. I am most impressed. I will follow your methodology the next time I change oil.